Mix together the eggs, milk, flour, sugar, vanilla, salt& cinnamon. Heat a large skillet, or griddle. When the skillet is hot, add 1 tablespoon butter. If the butter smokes, your pan is too hot; turn down the heat. Dip each slice of bread into the batter for 30 seconds on each side. Let some of the batter drip off, then put in skillet. Cook each slice 1 1/2-2 minutes per side until each side is golden brown. Add more butter, if necessary, to cook all of the slices. To serve, put on plate, dust with powdered sugar. 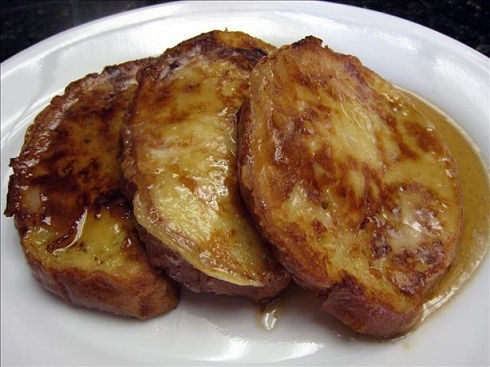 Serve with butter & hot syrup.